This week I am going to try to get my Roll Roll Cotton Boll finished and off the floor. It was to big for my Design Wall, so it is sitting on the floor of one of the bedrooms. This is a Bonnie Hunter Mystery Quilt that started in November and ended in January. I especially liked making the string blocks and am looking forward to making them for another quilt. 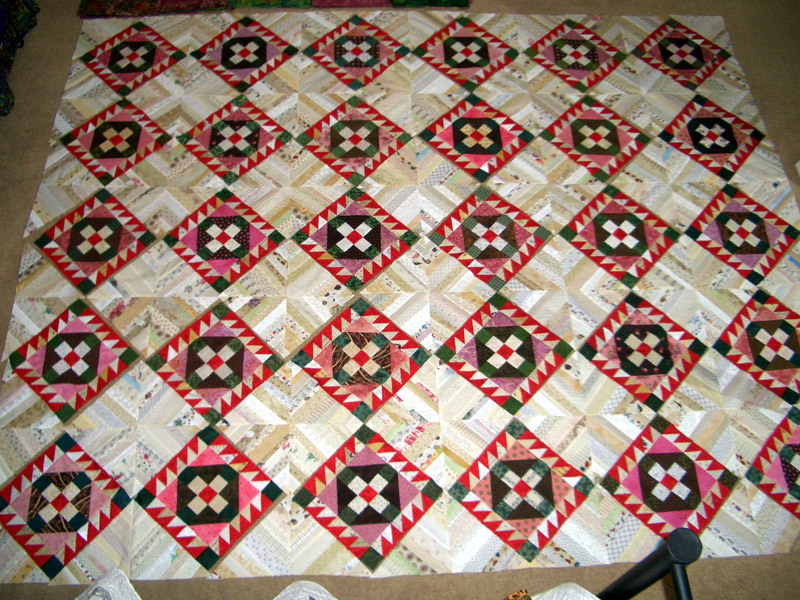 I still have to sew the blocks together in rows, add a green inner border and then a pieced outer border. Will use up fabrics from my stash for the backing and binding. This looks great! I thought about doing this one but I have so many ufos I decided to be "good" and not start another one! Yours looks great! Very pretty and so close to being done!! How about if I bring Kaos and Koko over for a visit? They'd love to help you put lovely RRCB together! I do recall the clue where you learned all the string blocks were to be sliced up...you weren't exactly happy about that! So Bonnie it seems changed your thinking because you're ready to do it again (and so soon!!). Bring on the strings! I thought when I saw the Kerry's quilting that you were probably the Kerry Sandi talks about all the time. Love your quilting!!! Looks beautiful! 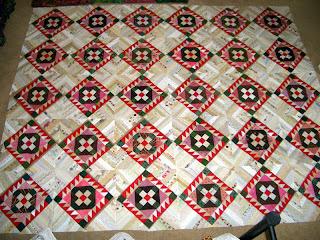 I have a long way to go on mine but like you I really enjoyed the strip piecing. I Love your RRCB! I spent a good part of yesterday sewing the center of mine together. I'm glad I read your post because I COMPLETELY forgot about the green border!! I have been joining my pieced border together like a mad woman. Like all of Bonnie's quilts - this is taking FOREVER! Lovely! Love the color combination! Great job Kerry, love the look you gave it. I think this one will take a long time to do the binding. Very nice. I didn't make this one. I love the color combination of yours.